This is a great article about teaching fractions! 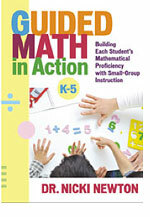 A must read for addition, subtraction and division of fractions! Yahoo! Definitely use pattern blocks. Do these types of lessons in guided math groups so that students can talk through the math they are doing. Also, have them explore fractions with pattern blocks in math centers. What have you done with your popsicle sticks lately? Counting wheel with textured sticks. Counting with sticks and beans. Kindergarten Crayons has some great activities for adding through the teen numbers and more. Big Popsicle Sticks and lima beans make great place value manipulatives. Check out the pictures and activity sheets on this blog. I also like the “Teen Books.” Great Place Value Ideas!